Daniel J. Mitchell of the Cato Institute just drew my attention to this excellent video created by Government Gone Wild. Earlier videos from Government Gone Wild that I have seen have been excellent also, which is an assessment with which Daniel Mitchell agrees. Looking at state unemployment percentages and their changes over the last year for the purpose of trying to envision the effect upon the November presidential election is difficult. This is because the unemployment percentages become meaningless due to people dropping out of the workforce in this interminable Great Socialist Recession. We also know the seasonal adjustments are suspect due to unusual effects in this very long jobs recession. Fortunately, the one really useful table for dealing with election effects in the Bureau of Labor Statistics State Unemployment Report based on July 2012 data is Table 4. 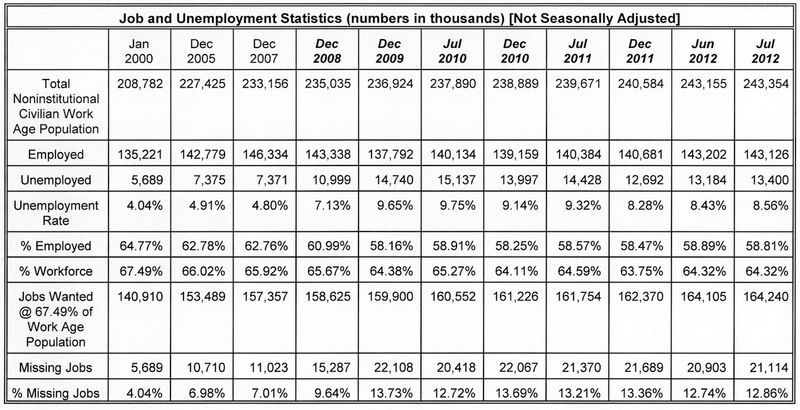 This table provides Labor Force Data without Seasonal Adjustment. Unfortunately real employment numbers are not given, but the workforce number is very important in its own right. Clearly, the people of a state whose civilian labor force is shrinking are likely to feel as their state economy is hurting and are likely by now to hold this against Obama. A shrinking workforce means that the sum of the people employed or considered by the BLS to be actively seeking work has become smaller in the time from July 2011 to July 2012 in Table 4. If the number is shrinking, then employment is not growing and/or discouraged people have given up looking for work. Even when a workforce is growing, this is not necessarily adequate growth for a growing population. We have to remember that from 2000 to 2010, the Census told us that the population grew by 1.0% a year. In normal times, this would mean that unless employment grew by 1% a year, unemployment would go up. The people of these states should be furious at what Obama and the Democrats have done to the economy to keep it from recovering from the recession. Of course the people of Connecticut and Hawaii do not have nearly enough sense to be furious, but there should be numerous people in the other states who will be as they think more and more about how miserable they are in this never-ending recession. The states in red are pretty certain for Romney, while those in blue are certain for Obama. The other states in black should be feeling a substantial desire to turn to Romney to help end their woes as the people of those states think more a and more about who they will vote for in November. Iowa, Ohio, and Nevada are generally thought to be swing states in the election, while New Mexico and Oregon are thought to be leaning to Obama, but may prove unstable with time and may require Obama to spend some time campaigning in them so he will not lose them. Only Maine and Virginia managed to generate workforce growth above 0.5%. The average workforce growth for these critical electoral vote states was only 0.43%. We find that every one of the swing states or states that are tenuous now for Obama is on one of these two lists. This presents a strong opportunity for the Romney-Ryan ticket to build its electoral vote count enough to win the election. In fact, the people of these states will have to be very disappointingly unobservant if they do not turn strongly toward the pro-private sector Republican ticket with its interest in strong businesses, many more jobs, and a lower cost of living. Romney could well win Iowa, Nevada, Ohio, Colorado, Florida, Michigan, New Hampshire, North Carolina, Virginia, and Wisconsin based on their workforce weakness over the last year. This would give Romney a 317 to 221 electoral vote win over Obama. This is close to my 25 June prediction here. This last weekend, I saw an Obama ad actually endorsed by him that sought to push Romney to release more tax returns and made the claim that Romney "paid only 14% in taxes -- probably less than you." I believe this was a fallacious and misleading claim, but PolitiFact.com ruled it true by ignoring the context of the ad with a giant switcheroo. The Obama ad is a discussion of Romney's tax returns, which report on his income taxes. One naturally assumes that the final statement by Obama that Romney probably paid less in taxes than you means that he probably paid less than you in income taxes. So, let us discuss the truth of Obama's claim based on income taxes reported on the income tax forms Obama is demanding Romney add to those already released. I was stunned because most Americans who pay any attention to politics, government, and the economy are well aware that about 46 - 48% of Americans pay no income tax at all. Immediately this would make one think it is unlikely that half of Americans are paying 14% in taxes on their Adjusted Gross Income (AGI). In fact in 2011, Romney paid a 15.37% average effective tax rate on his AGI and he claims he paid 13% or more in every one of the last ten years. This contradicts Biden's claim that he often paid no taxes in this period of time. Apparently, Biden's unnamed source was rather impeachable, as is Biden's intellect. The median household income in 2010 was $47,022. According to Table 3.4 of an IRS study of 2010 Individual Income Tax Returns, broken down by tax brackets, one can estimate an upper bound on the average effective tax rate on AGI for a taxpayer with median income. 142.89 million individual tax returns were filed in 2010, we can examine when we reach half this number of tax returns (71,446,026 returns) as we work down the column in the table of tax returns by margin tax rate. Including all returns with a marginal tax rate of 10% or less, we have accounted for 63,744,030 returns. The next group in the table is 42,321,591 returns in the 15% marginal tax bracket without capital gains. Adding this to the lower tax brackets takes us way over the mid-point number on the returns of 71.45 million to 106.07 million returns. The median return is clearly among the first one-fifth of the returns in this large group of returns. Nonetheless, the average effective tax for this entire 15% marginal tax rate bracket group is only 5.1% of AGI. The 10% tax bracket that brought us close to the median return paid an average tax of only 0.7%, so it is likely that the median return paid substantially less than 5.1% of AGI! So, the Obama ad claim that you probably paid more taxes than Romney is false. But no, according to PolitiFact.com, the Obama claim is true. How do they substantiate this claim? Well they decide that Obama, the context of the remainder of the ad notwithstanding, was talking about the sum of income and payroll taxes. Of course, they choose not to add in property taxes because that is not something the Democrats wish to consider when they talk about comparing the taxes of the rich and the median person. According to our Democrat politicians, the Medicare and Social Security money extracted from our paychecks by unpaid tax collecting employers goes into a lock box and is paid back to us when we retire or reach age 65. They like to call it an insurance premium which will lead to payouts to us in retirement which scale in accordance with the amount of premiums we paid in. But in this context it is convenient to forget all that and treat this payroll extraction as general tax money and forget that Romney gets a worse deal in payback even than the median taxpayer does from these extractions. Now most people have an employer who according to the government pays half of the Medicare tax and, generally, half of the Social Security tax. So, the employee's share of Medicare is 1.45% and his usual share of Social Security, before the recent 2% reduction of limited duration, was 6.2%. Adding these together would produce an upper bound average tax payment on AGI of 12.75% in normal times, but of only 10.75% in 2011. This is lower still than Romney's effective tax rate. Oh, but wait. The truth, always suppressed by Democrats otherwise, is that it is a fiction that the 6.2% for Social Security and the 1.45% for Medicare paid by the employer is really paid by the employer. People who are self-employed pay it all and those who work for an employer are actually paid less by that amount because of this extraction. That money would have been paid to the employee in the market for labor if it were not siphoned off by the government instead. This is the argument of the Tax Policy Center of the liberal Brookings Institute. As a result they add in both the employee's and the employer's extractions for Social Security and Medicare and claim that the median taxpayer probably does pay more tax than does Romney. If the Democrat fiction on employer contributions to Social Security and Medicare were maintained, then Romney could claim his share of those payments as a shareholder in many companies with many employees and show that he paid a much, much larger tax due to his huge employer tax payments! But it does not work that way. Inventive approaches to issues are the province of Democrats only. Republicans are usually too straightforward to make such arguments and if they did, the Progressive media would raise an incredible fuss! We really ought to also remember that the many companies partially owned by Romney as a shareholder may have paid the world's highest corporate taxes on any profits they made. They also spent a fortune on foolish laws, mandates, and regulations arising from local, state, and federal governments for vanishingly small or non-existent benefits for Americans generally. More and more, these governments delight in moving the expenses of gifts to others, commonly to special interests, to the accounts of businesses in the private sector. The governments are awash in red ink, or they would be if they were forced to do the kind of accounting that businesses are forced to do by governments. So, they force businesses to pick up the tab more and more often without regard to the impact on lower profitability, less hiring, less capital investment, and more bankruptcies for businesses. Not only does Romney pay out huge sums on his investment in many companies making these government mandated payments, but he also pays a capital gains tax on any money earned by him due to sales of appreciating stock. Romney does much more than his fair share in supporting the cost of government. Democrats like to make the claim that median U.S. worker income has been almost stagnant since 1980. This is said to show that trickle-down, supply-side, or self-responsibility economics does not work for the median worker. Only the rich benefit, they say. Let us examine this claim. It is true that between 1980 and 2005 the median worker income minus benefits increased a mere $700 from $25,000 in 1980. This ignores the fact that benefits grew at a much faster rate than did worker compensation in the form of direct income. It also ignores the fact that many more workers with incomes above the median are making much more money now than they were in 1980. Average income went up much more than did median income. In 1980, only 23% of all jobs were considered high paying professional jobs, while more than half of all new jobs since 1980 are high paying professional jobs. If this were to continue into the future, more than half of all jobs in existence will become high paying professional jobs and the median income will climb sharply. But as yet, the median job is not a high paying professional job. But we should note that the stagnation in median income is not due to most new jobs being burger flipping. There is further news indicating that the median income figures for all workers are hiding the important truth. It turns out that both white men and white women in the workforce have had much higher income gains since 1980 than the reported all worker gain of 3%. White men have gained in income by 15% and white women have gained by 75%! Does this mean that non-white workers have lost income since 1980? No, not at all. Nonwhite men gained 16% in income. Nonwhite women gained 62% in income. Every one of the individual categories gained many times more than 3% in income since 1980! The reason the median income for all workers barely increased was because the workforce came to be increasingly composed of nonwhites and white women whose median group incomes were below the median income of all workers in 1980. Changing demographics is the explanation for the nearly stagnant median income minus benefit result. The median income for white men rose from $30,700 to $35,200, moving most of their income distribution curve well above the total worker distribution curve median. Nonwhite men increased their income from $19,300 to $22,300. White women raised their incomes from $11,200 to $19,600, while nonwhite women raised theirs from $10,200 to $16,500. Because the fraction of the population which is nonwhite is growing, part of the reason for their lower incomes is because the nonwhite men and women have lower median ages and therefore less job experience. Younger people with less job experience generally earn less. The fact that the median income of all workers has been essentially stagnant between 1980 and 2005 is not an indictment of supply-side economics or Reaganomics as the Democrats love to claim. This is a result of the very large increase in the fraction of nonwhite workers in that period who have long had lower incomes than white males. This rapidly growing nonwhite worker fraction also has a lower median age and therefore has less job experience. The employed Hispanic population was the primary growth fraction of the employed in 2005 compared to 1980. The fraction of white workers decreased by more than 6%, while the fraction of black workers went up about 7%. The fraction of Hispanics increased by a factor of 2.43! Between 1980 and 1990, the labor force participation rate for women grew rapidly before plateauing from then until 2005. The labor force participation rate of men fell slightly from 1980 to 2005. This also caused the fraction of workers in a lower earning group to increase. Supply-side economics or Reaganomics was advanced as a method to raise all boats. It performed as advertised, despite being applied in only a modest and half-hearted manner. White female worker and nonwhite female worker income advanced sharply, 75% and 62%, respectively. White male and nonwhite male incomes advanced less dramatically, but they still increased 15% and 16%, respectively, from 1980 to 2005. We should all be reasonably happy with these results in the face of a rapidly changing demographics. The July 2012 Bureau of Labor Statistics unemployment report of the Household Survey without any seasonal correction of data, revealed a loss of 76,000 jobs in July compared to June. This was rarely reported in the mainstream media. The nominal, though rather meaningless, unemployment rate went up from 8.43% to 8.56%. The percentage of the population with jobs dropped to 58.81% from 58.89% in June. The headline statistic reported by the mainstream media was that 163,000 jobs were added in July. This was based on seasonally adjusted data from the Establishment report, but there are problems with the seasonal adjustments in this unprecedented recession and there are a record number of self-employed people these days since they cannot find jobs otherwise. Many of those self-employed people decided in July that they were not really effectively employed any longer. They had tried self-employment in desperation and failed in the uphill struggle with the Obama economy. To take the fate of these people into account, we need to examine the Household Survey data, as I have been doing all along in this unprecedented and never-ending recession. The number of missing jobs is calculated based on the employment workforce of January 2000 when many quality jobs were available and the unemployment rate was 4.04%. The workforce then was 67.49% of the total non-institutional civilian working age population. The number of missing jobs in July 2012 is slightly lower than it was in July 2011 by 256,000 jobs, but it is higher by 696,000 jobs than it was in the miserable month of July 2010! 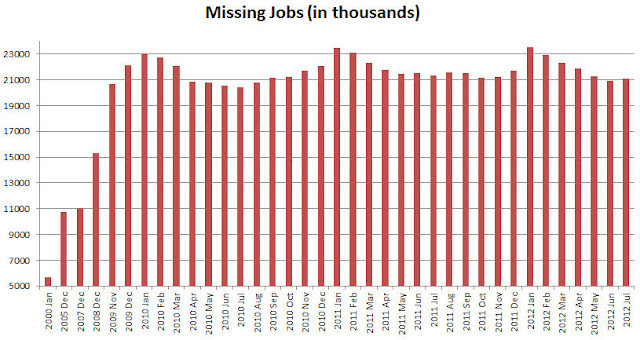 In two years of supposed recovery the number of missing jobs has actually increased by almost 700,000. This is not a real recovery. It is all smoke and mirrors. The percentage of missing jobs compared to those wanted went up from 12.74% in June to 12.86% in July. Biomedical and diagnostics companies such as Medtronic, Boston Scientific, Stryker, Covidien, Abbot Labs, Qiagen, Invacare, GE, SurModics, WorldHeart Corp., the Cordis Div. of Johnson & Johnson, C. R. Bard, BioMerieux, Celera, Cardo Medical, Resetta Genomics, and Care Fusion are all laying off employees, many citing the 2.3% tax on all revenues, not profits, from biomedical devices and on clinical testing in ObamaCare, or more accurately, ObamaUncaringTax. Defense companies are doing the same in anticipation of the large cut-backs in defense spending brought on by the sequestering of defense funds as the Democrat Senate has failed to produce a budget in the entire presidency of Obama, or over 1203 days or 3.3 years. This budget is required by law for very good reasons, but this Senate is lawless. A recent study by George Mason University scholars calculates that the sequester cut-backs in military equipment purchases and R&D will result in the loss of about 1 million jobs. Because the reduction in funds begins on 2 January 2013 and the WARN Act requires companies making large layoffs to give employees 60 days notice, these reductions will substantially have to occur by 3 November 2012. Identifying the victims and processing such large numbers of lay-offs takes a massive amount of management time and hurts productivity. The best way to handle such a process is to begin paring employees early, which many of these companies have been and continue to do. Most of these cuts have nonetheless not yet been announced or made. The Obama and EPA war on fossil fuels also is killing jobs. Coal mines are closing and coal-fired electric power plants are closing. Some railroad jobs will be lost as a result. Because electricity costs are going up substantially as a result of losing low-cost coal-fired power plants and the mandates for very expensive wind and solar power, many businesses have higher costs and cannot hire added employees or are losing those they had. The Obama restrictions on offshore and federal lands drilling and exploration for oil have caused many potential jobs to be lost in those activities. America has an incredible portion of the world supply of coal, oil, and natural gas. Feeder and long-distance oil pipelines have also not been built, which would have provided many jobs. Refinery expansions and new refineries are badly needed, but regulations make such investments very hard to make. This is another lost opportunity and results in higher fuel costs for transportation and higher plastic costs as well. These higher costs inhibit the growth of many companies and add to reductions in consumer disposable income. This senseless Obama vendetta has cost Americans many, many jobs. Good government does not steal so much money and other resources from the productive private sector. Good government is minimal government and serves only to protect the sovereign rights of the individual to life, liberty, property, the ownership of one's own mind, body, and labor, and the pursuit of happiness. Such legitimate government makes way so that a robust private sector can produce a cornucopia of jobs, products, services, and ideas. The illegitimate Obama government is greatly inhibiting the private sector and preventing the private sector from generating this abundance of wealth. The role of government in producing jobs is simply to get out of the way. That is a fact the Democrat Socialists will never understand. If you want jobs and a healthy economy, this Obama administration and this Democrat Senate must be dismantled as a result of the November election. A judge, John L. Kane, of the U.S. District Court of Colorado issued an injunction against the rules of the Obama administration that the health care payment plans under ObamaCare must provide for contraceptives. The Newland family owns the Colorado company Hercules Industries, which manufactures HVAC equipment and materials. They are a Catholic family and their company has several hundred employees to which they will have to supply Obama administration approved health care payment plans. They maintain that this violates their religious freedom and is in clear violation of the Religious Freedom Restoration Act. The Jimmy Carter appointed judge ruled that the Newland family case was sufficiently good that the injunction against enforcement by Obama's administration should be granted until the courts make a ruling in the case. In the Citizens United v. FEC Supreme Court ruling, the right of individuals in a corporate association to freedom of speech was maintained. The Obama administration had claimed that freely associated people in commercial activities lost their freedom of speech. The Obama administration is now saying that people associated in a commercial activity lose their freedom of conscience or religious freedom. I do not think that claim will hold up any better with the Supreme Court than did their loss of another 1st Amendment right to free speech. To be clear, I have nothing whatsoever against the use of contraceptives. But people who do should not be forced by government to violate their own moral values. Even religious ideas that I believe are irrational must not be threatened by government, if we are to maintain freedom of conscience and the freedom to independent thought.